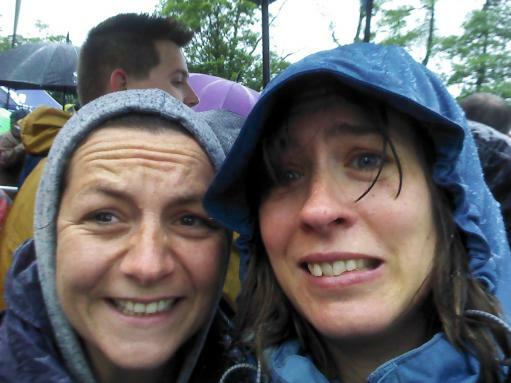 A huge congratulations to Sally and Jess for braving the weather to take on the Great North Swim to support our work. Thank you for being change-makers for AfriKids! "Some people do open water swimming in all sorts of conditions all the time. But then some people climb mountains or perform open heart surgery all the time. Jess and I do none of these things. She makes people laugh for a living by standing up and talking or sitting down and writing. I try and channel money to good causes by moving paper around an office and generally chatting. We both enjoy an occasional swim, preferably in a heated pool with a steam room at the end, but even that has become infrequent since the arrival of children. 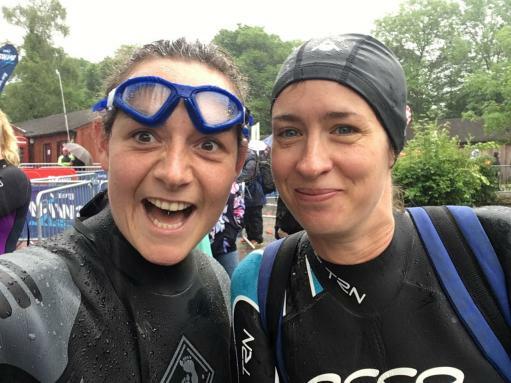 So competing in the Great North Swim in some of the worst weather conditions on record (the event had to be cancelled the day after ours due to strong winds) was no mean feat. However, as it turns out, when the world is in a mess and you feel like doing anything other than squeezing into a wetsuit and diving into a murky lake to swim a distance you’re not sure you can manage; the very best thing to do is just that. Once the various toddlers, husband and friend had carted themselves off out of the rain to Beatrix Potter world, Jess and I could focus on the task in hand. Soaked by the rain long before we got near the lake and surrounded by a motley bunch of swimmers of all ages, sizes, creeds, colours and swimming abilities we had a laugh, a bit of a warm up jig about and then plunged in. It was pretty cold and very hard to see anything through the murk and steamed up goggles but it was also invigorating and the backdrop was stunning, if a little hidden by fog. Anyway, we managed it. I got round the mile course in 32 mins, coming in placed 286. I’m sure I couldn’t have managed this if I’d actually done any training and knew what was in store. Having no idea and just swimming fast to avoid getting too cold seemed to work quite well in the end and after inhaling several flapjacks and putting on some dry clothes once I’d finished it all felt like quite an achievement. Of course, the real achievement was raising funds for AfriKids. Friends, family and Jess’ social media following came good and we were proud to exceed our target of £1,000. It’s a year since I left AfriKids this month. Sometimes it feels like a lifetime ago, sometimes I can’t believe I’m not planning my next trip out to Bolga. So it has been great to do a little something towards the new strategy that my old colleague and friend, David Pwalua, outlined with such clarity and passion at its launch in March this year. This work, focusing on Education, Child Protection and Health (i.e. the fundamentals of life) is life changing and is being delivered by the most dedicated and inspiring bunch of people you could hope to meet. So we are extremely grateful to everyone who supported us in this little folly that was the Great North Swim. Thank you!" You can check out Jess and Sally's fundraising page here and if you'd like to take on a similarly crazy challenge, please get in touch with Sarah at sarahballan@afrikids.org.